From the internationally bestselling author of THE BOOK OF RUTH and A MAP OF THE WORLD, a heartfelt coming-of-age story that Karen Joy Fowler calls "a timeless classic...a book you will read and reread." 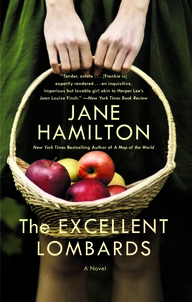 Mary Frances "Frankie" Lombard is fiercely in love with her family's sprawling apple orchard and the tangled web of family members who inhabit it. Content to spend her days planning capers with her brother William, competing with her brainy cousin Amanda, and expertly tending the orchard with her father, Frankie desires nothing more than for the rhythm of life to continue undisturbed. But she cannot help being haunted by the historical fact that some family members end up staying on the farm and others must leave. Change is inevitable, and threats of urbanization, disinheritance and college applications shake the foundation of Frankie's roots. As Frankie is forced to shed her childhood fantasies and face the possibility of losing the idyllic future she had envisioned for her family, she must decide whether loving something means clinging tightly or letting go. - Click here to visit Jane Hamilton's website. - Click here to connect with Jane Hamilton on Facebook.